Set in the 1980s during the Lebanese Civil War, BEIRUT is a fictional action film centring on a former U.S. diplomat who returns to service in the city of Beirut in order to save a colleague who is held hostage by the group responsible for the death of his family. Unlike films dealing with hostage situations like 7 DAYS IN ENTEBBE and ARGO, BEIRUT deals with the next best thing. It is a fictional story based on a true event – the hostage taking during the Olympics in Munich. While the lead is no super spy like James Bond, he is the next best thing, a diplomat that has revenge on his agenda, as in the Liam Neeson TAKEN films. 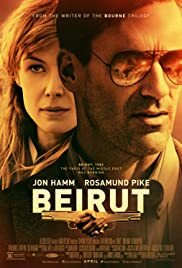 BEIRUT benefits from a script by Tony Gilroy who penned the BOURNE films and more important, also directed one BOURNE film and the excellent MICHAEL CLAYTON. There are shades of MICHAEL CLAYTON in BEIRUT with the main character similar to the George Clooney character and a strong supporting female character here played by Rosamund Pike. The film opens in 1972 at a posh party thrown by Mason Skiles (Jon Hamm), a U.S. diplomat living it up in Beirut with his wife Nadia (Leila Bekhti). They have no children of their own, and so they adopt and treat 13-year-old orphan refugee Karim (Yoav Sadian Rosenberg) as family. Karim serves hors d’oeuvres. During a posh cocktail party, however, uninvited guests bring unwelcome news: Not quite so alone in the world as he’d pretended, little Karim has an older brother. Things never go as well as planned – especially not in movies. Mason is then informed that Karim is the brother of Abu Rajal (Hicham Ouraqa), a notorious Palestinian terrorist linked to the recent Summer Olympics massacre in Munich as well as other attacks. Just as Mason is about to say, “I don’t believe it,” the party is stormed by gunmen under the orders of Rajal attempting to spring Karim. To cut a long story short, Mason is sent home, takes to the drink but later asked to return to Beirut, There he learns, that his friend Cal of the CIA (Mark Pellegrino) is held hostage by the now grown Karim. Karim wants his brother Abu Rajal freed. Despite the long story, it is an interesting one and one that allows a mild mannered man to resume his glory days and save the day or in this case, his best friend Cal. The subplot between Mason an cultural attache Sandy Crowder (Pike) makes a good diversion. The film feels like a mix between MICHAEL CLAYTON and the BOUNRE movies. Morocco, where the film is shot stands for war-torn Beirut. Unlike most action films where the heroes spurt out funny one-liners, the dialogue here is more subtle and at times a bit cynical, which suits the mood of the film. Hamm makes a good reluctant hero. The film has had complaints of being racist. The film’s trailer ended with voice-over from Mr. Hamm’s character: “2,000 years of revenge, vendetta, murder. Welcome to Beirut.” It does not help too that Beirut looks nothing like the real Beirut since the film was shot in Morocco.